IN 1851, a group was founded known as the “Liedertafel” by a group of German-American men and Reverend Karl R. Weitershausen and met at the Weitershausen Church on Canal Street. BY 1854, the immigrants who were gathering to sing the songs of the “Heimat” and share the old experiences at the “Liedertafel” decided to form a chorus called the “Teutonia Männerchor.” This was just nineteen years after the founding of the first German singing society in America – in Philadelphia. Around 1882, the Männerchor met in Dahlingers Hall at 121 Madison Avenue and the growing membership decided that they needed a larger place to meet and sing. IN 1888, after selling 300 “Building Shares” for $25 each. Our present hall was completed. A “Damengesellschaft” was formed and the ladies held a dinner to help with the purchase of furnishings. TO THE END OF THE 19TH CENTURY – the club continued to grow and enjoy popularity and began to be (as it is now) a center of German cultural interests. 1904 – The 50th anniversary of the founding of the club was celebrated with dinners and special events and an imposing parade through the business district of East Ohio Street. THE WORLD WAR 1 YEARS – The club participated in the National Sängerfest in 1914 but it was the last such event to be held until after the war. All outside events were suspended during the war, but internal functions continued. In 1918 a patriotic rally was held and a flag ceremony held to honor the members who had served in the United States Army. POST WWI – National Sängerfest resumed, along with other club activities. The national gatherings attracted several thousand singers and were held every 3 or 4 years. The 1934 gathering was held in St. Louis. 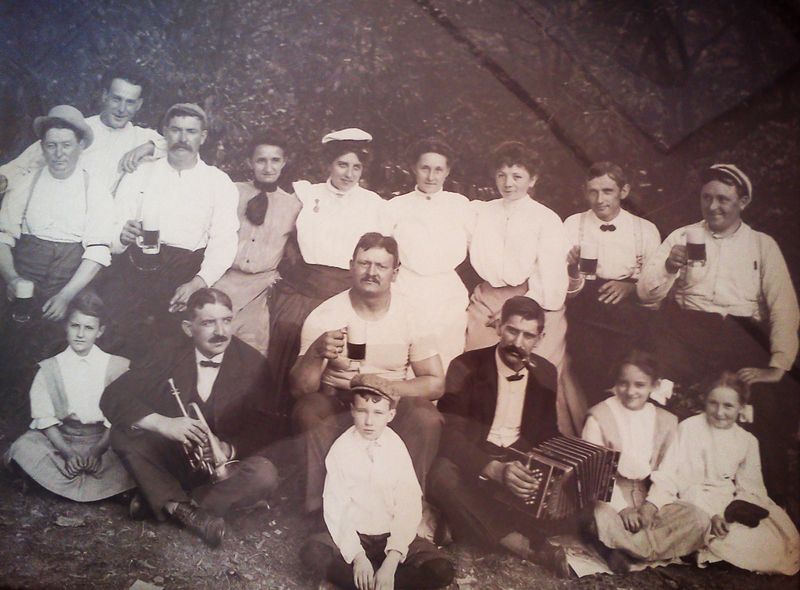 That same year, the basement was converted into an authentic German Ratskeller, looking much as it does today. The last Sängerfest before the start of the war was held in Chicago in 1938. The ladies had formed the Damenchor in 1935 and made their first appearance. THE WWII YEARS – were difficult for the club and was a period when the club was looked upon with some suspicion, including surveillance by the FBI. The clubs tax-exempt status was not granted until after the war in 1947. THE EARLY POST WWII YEARS – saw a new influx of German immigrants to the club. Some were “war brides” of American GI’s who had served in post WWII Germany. Others were individuals who came for the traditional reasons of immigrants to the U.S. They added a valuable resource that has helped the club continue and refresh its’ heritage. 1954 was our 100th anniversary and was again celebrated in grand style. In 1967, Pittsburgh hosted the National Sängerfest and opened the roof of the then new Civic Arena. Over 2,000 singers attended! The post WWII German immigrants provided many new members anxious to revive the memories of their childhood. Many had extensive family in Germany and the club enjoyed visits from these relatives and continued contacts with the many similar singing societies still functioning in Germany. This led to visits and joint programs with these societies and bands. The first tour of Germany by our Männerchor and Damenchor in the early 1990’s resulted from these relationships and was a resounding success and led to two more such tours. 2004 was the club’s 150th anniversary and was celebrated in grand style. The club received significant publicity and reached out to the public. It began with a massive cocktail party – “The Jubiläum Anfang” in January. There was entertainment continually in the Ratskeller and the Hall, with regional delicacies offered throughout the club – over 400 members attended. A formal Dinner and dance was celebrated in Pittsburgh’s Grand Hall at the Priory (the converted St. Mary’s German church which shared its founding date with the club – 1854). Late summer was the outdoor celebration that was the centerpiece of the year and included the public. An enormous, steel frame tent was installed, German vendor booths and food booths were set up. And, of course, a Beer booth included German and domestic beers. Several German singing, dancing and band groups attended – as well as local area clubs. There was a full program of music, singing, dancing and eating. More than 3000 people attended and enjoyed the club. 2016 - After a long history of being a club where only men were full members, the Members voted to have woman be full members. Any existing women who were associate members could elect to become full members, as well as any new women who joined Teutonia. Looking ahead to 2054 (our 200th Anniversary) and beyond, the club enjoys good membership, financial strength and growth. It’s a very bright future for the Teutonia. We preserve the old German (Deutsch) traditions, staying “current” with cutting edge communications and efforts that fit today’s modern lifestyle. As one member put it – “for our great grandparents and our great grandchildren.” We intend to be around for many years in the future.